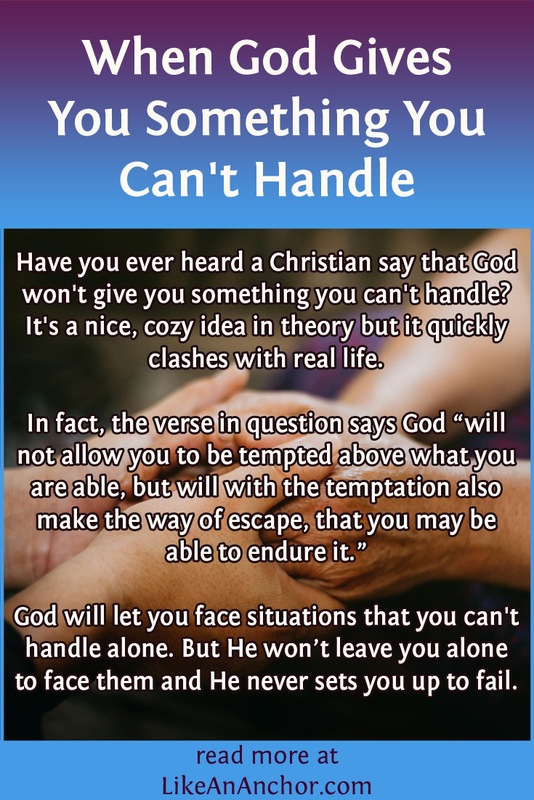 Have you ever heard a Christian say that God won’t give you something you can’t handle? It’s a nice, cozy idea in theory but it quickly clashes with real life. What about my two Christian friends who committed suicide? Should they have been able to “handle” it according to this reasoning? And what about all the families I know who are reeling in the wake of unanswered prayers for a child who died? Are they being punished because God knows they can “handle” such a tragic trial? Or what about my personal battle with anxiety and depression? Am I failing to “handle it” when I turn to a counselor for help? While the idea that God won’t give you more than you can handle is taken from a scripture (1 Cor. 10:13), that’s not what that scripture actually says. Church people have twisted this verse into a feel-good platitude when there’s a lot more going on. Now all these things happened to them by way of example, and they were written for our admonition, on whom the ends of the ages have come. Therefore let him who thinks he stands be careful that he doesn’t fall. The Greek word translated “temptation” is peirasmos (G3986). It means a trial or “putting to the test” of a person’s character. When used of God, it means proving someone by bringing them “through adversity and affliction in order to encourage and prove their faith and confidence in Him.” When used of the devil, it means he’s soliciting someone to sin for the purpose of making them fall (Zodhiates’ Complete WordStudy Dictionary of the NT). In context, the verse we’re talking about isn’t a promise that God won’t give you more than you can handle on your own. It’s a promise that He won’t let you be in a situation where your fall into sin becomes inevitable. He never sets us up to fail. The Bible doesn’t say God won’t give you more than you can handle. It says that He won’t “allow you to be tempted above what you are able, but will” provide an escape so you can endure it. The word translated “endure” is hupophero (G5297). It means to bear up under a thing placed on one’s shoulders. Metaphorically, it means patient endurance. God doesn’t promise that there won’t be trails or temptations, or that we won’t have burdens that are hard to bear. It’s rather the opposite, in fact. Jesus said, “in the world you will have trouble; but cheer up! I have overcome the world” (John 16:33, WEB). We have hope, not because we’re promised an easy life, but because we’re promised help getting through the life we have. The rest Jesus offers is one that heals our souls, not one that takes away our struggles. Yokes are something used for work, not something you take a nap in. They’re put on an animal’s or person’s shoulders to make hauling, pulling, or carrying things easier. 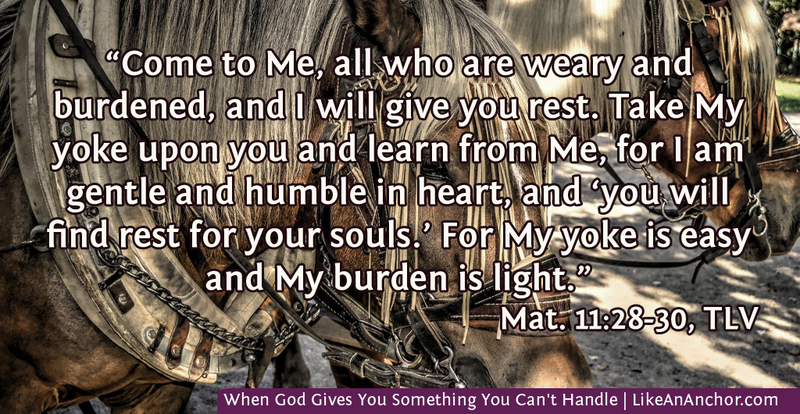 The reason Jesus’ yoke can be described as “easy” is because he’s yoked together with us, helping us handle the burdens of life. God won’t put you in a situation that you can’t walk through faithfully with His help. But He does give us plenty of things that we couldn’t handle on our own. We’re not meant to be self-sufficient. In fact, that’s one of the first lessons we should learn when we seek a relationship with God — that we can’t do anything on our own. Even Jesus said when He lived as a human, “I can of myself do nothing” (John 5:30). We can’t earn salvation, we can’t make ourselves righteous, and we can’t win spiritual battles without God’s help. We need to stop shaming other Christians for needing help. God doesn’t. In fact, He welcomes the chance to be more involved in our lives when we turn to Him for aid. 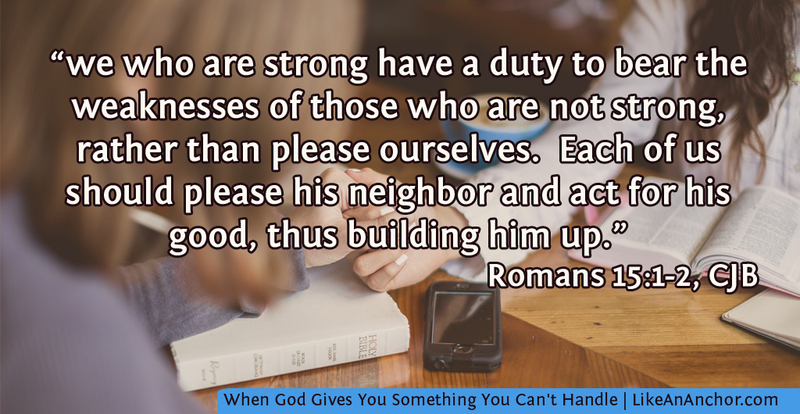 So rather than share empty assurances that “you can handle it,” we should look for ways to imitate God and actually help other people. Back in 1 Corinthians 10:13, Paul writes that temptations will come with a way of escape that makes it possible to endure. Have you ever thought that you might be that way of escape for someone? When I last wrote about this verse back in 2014 ( click link here to read), this is what I focused on. Christ’s body, the church, is supposed to work together and build itself up in love (Eph. 4:16). Every individual supplies something that can help edify the whole and also build up other individuals. Sometimes we need others and sometimes we must be there for others. God will let you face situations that you can’t handle alone. But He won’t leave you alone to face them and He never sets you up to fail. We might not always understand why God lets some people go through such overwhelming trials. However, He will be there with you, guiding you through and working things out for good in the end. And He can put people in your life to help as well, but that means His people have to be ready and willing to help each other. We have to pay attention to our brethren and maintain relationships so we know how to be there for them. I am in a spot where I feel like god put me there to help but I dont know how to help or what to do. That’s always so hard — feeling you should help but not knowing how. I’m praying the Lord guides you and shows you the best thing to do in this situation.